Cold & Spicy Korean Noodles — Oh Wonderful! Here we go again with the ultimate lazy girl meals. MONDAYS, amirite? Half of my apartment is packed up for an impending move to the cit-ay, and I feel immense pressure to eat everything that’s left in my cabinets so I don’t have to drag it across the bridge. My half-Korean side came out in full force this weekend when I started having immense cravings for naengmyeon. But, instead of grocery shopping for seven ingredients that I wouldn’t use before week’s end, I looked at what I had and whipped this up. Easier to transport than actual naengmyeon, and therefore much more lunchable at work. 1. Combine all ingredients in a food processor and blend until smooth. Once blended, pour into a small bowl and refrigerate for at least an hour. 2. Bring water to a boil and cook pasta to your liking (I cook until soft, which takes about nine minutes). Rinse and drain your pasta and place a few ice cubes in a strainer. Allow to sit and cool for about 30 minutes. 3. 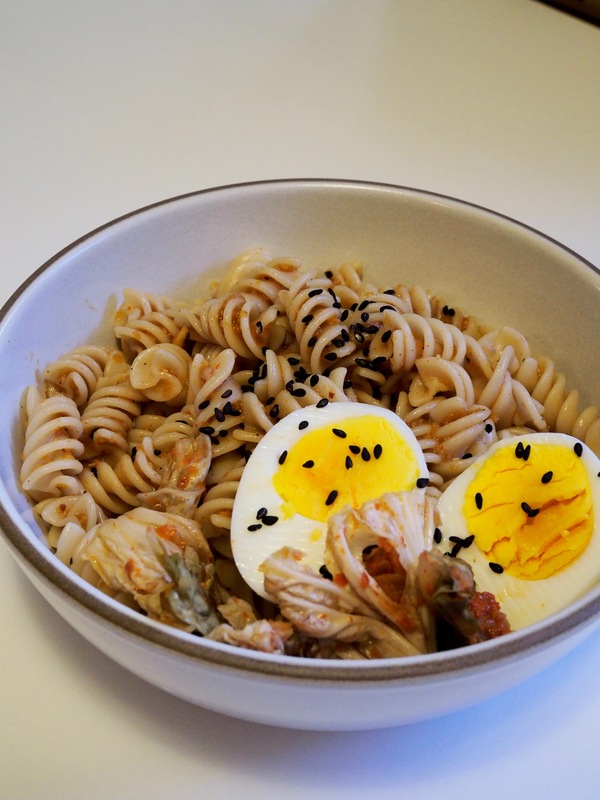 When your sauce has chilled and your noodles have cooled, mix together, top with a hardboiled egg and enjoy!